Over the course of this year Research Remix will be hosting several events, including a workshop in collaboration with the JHMI Art as Applied to Medicine, and a speaker series at MICA. The creative projects made throughout the source of Research Remix will be exhibited on campus in April. Keep your ears open for our events, the first one will be on February 13th in Jones 101 of the Mattin Center from 4-7 PM. 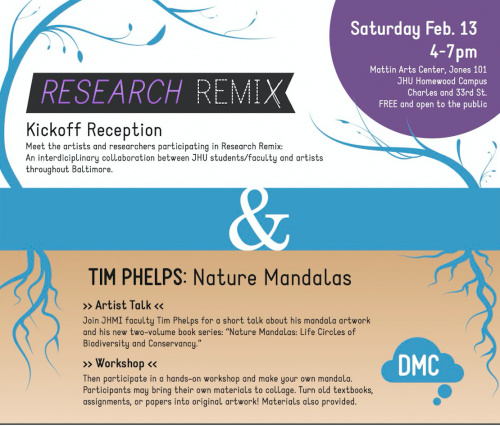 It’s free, and open to the public, and will operate as both an opportunity for artist and researcher participants to meet and communicate, as well as an opportunity to hear Tim Phelps, a Hopkins faculty member and medical illustrator, talk about his recent two-volume book series Nature Mandalas: Life Circles of Biodiversity and Conservancy. He will also be leading an optional mandala workshop, which all attendees will be welcome to join. If you want more information about the event, future events, and profiles of all our participating artists and researchers please visit reasearchremix.com. In addition, we are still accepting research posters, so if you have an exiting project, please share it with us! If you would like to see some of the breathtaking work from last year’s project, visit researchremix.tumblr.com. We’ll be posting flyers and publicizing events throughout the semester, so keep your eyes open and please consider attending if you have any interest. This has been such an interesting an informative experience for me, and I think it could easily benefit many others.